"One day, the kingdom of the peaceful mushroom people was invaded by the Koopa, a tribe of turtles famous for their black magic. The quiet, peace-loving Mushroom People were turned into mere stones, bricks and even field horse-hair plants, and the Mushroom Kingdom fell into ruin. Mario, the hero of the story (maybe) hears about the Mushroom People's plight and sets out on a quest to free the Mushroom Princess from the evil Koopa and restore the fallen kingdom of the Mushroom People. You are Mario! It's up to you to save the Mushroom People from the black magic of the Koopa!" –Super Mario Bros. Nintendo Game Manual, 1985. The Nintendo Entertainment system was released in 1985 and retailed for $199USD (approximately $415 today). The standard package included an 8-bit graphics Nintendo Entertainment System console, two rectangular game controllers, and a Super Mario Bros. game cartridge. 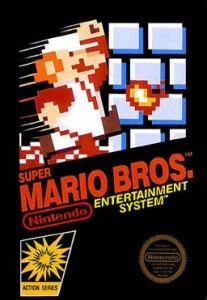 Super Mario Bros. would later go down as the best-selling title in NES history, and the pioneer of the Super Mario game dynasty. As quoted directly from the Super Mario Bros. game manual above, you play as Mario on a quest to rescue Princess Toadstool from the nefarious Bowser, King of the Koopas, though Mario's younger brother, Luigi, joins the quest in two-player mode. Players must take turns in two-player mode, alternating after either Mario or Luigi dies. Although there is no mention of it in the official game manual, Mario and Luigi eventually became known as plumbers and even had their own TV show and movie based around that theme. Super Mario Bros. is technically defined as a 2-dimensional side-scrolling platformer in which the player must control Mario or Luigi via walking, running, or jumping throughout various forms of landscapes such as outdoor brick lands, underground pipe worlds, menacing oceans, foreboding castles, and secret areas that involve mushrooms and clouds. Mario comes in three forms: Mario, Super Mario, and Fiery Mario. Regular Mario is capable of stomping enemies and is sometimes preferred due to his small, accessible size. In order to smash brick panels, Mario must attain a yellow Magic Mushroom that transforms him into Super Mario, causing him to grow twice as tall. However, Mario's most powerful form is Fiery Mario, which adds the ability to throw fireballs at enemies in addition to smashing bricks, and is achieved by finding a Fire Flower. While journeying throughout the Mushroom Kingdom, Mario will encounter enemies from the evil Koopa tribe. Badly behaved shuffling mushrooms called Goombas, shelled Koopa Troopa turtles, Koopa Paratroopers (Flying Koopatroopas), Buzzy Beetles with fireball-resistant shells, and Pirhana plants that attack from pipes will attempt to hinder Mario's progress. However, there are more powerful enemies that can pose as deadlier threats to Mario without the help of a yellow Magic Mushroom or Fire Flower. The Hammer Brothers are a pair of giant twin-brother turtles that chuck hammers while Lakitu is a mysterious turtle that hides in a mobile cloud and chucks Spiny enemies at Mario from up above. 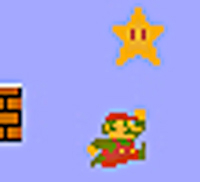 In the higher levels, Bullet Bills (giant bullets) fly toward Mario, and unpredictable flying Cheep-cheep fish will bombard Mario early on in the game. While under water, Cheep-cheep fish and despicable Bloobers (squids) can only be killed via fireballs, otherwise they make escaping ocean levels quite difficult. Of course, the most formidable opponent of all, King Bowser, awaits in the final castle of the game in Level 8-4. 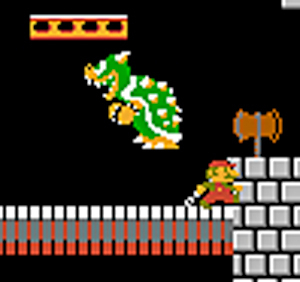 However, an imposter Bowser is found in the final castle at the end of each level. Each castle grows increasingly difficult and is scored by a petrifying and sinister soundtrack. As Mario jumps over lava pits, ducks beneath fire ball shafts, and eludes Bowser's signature fire blasts, he must either pelt the King Koopa with his own fireballs or sneak around him to fetch the ax, which chops the bridge of doom down and sends the evil giant turtle into a sea of glowing lava. Mushroom retainers, which would later be referred to as the character Toad, await Mario to alert him that his Princess is in another castle, that is until the last level (8-4), where Princess Toadstool finally awaits Mario and sends him on a more challenging quest. One of the most charming aspects of Super Mario Bros. is the game's network of secrets. 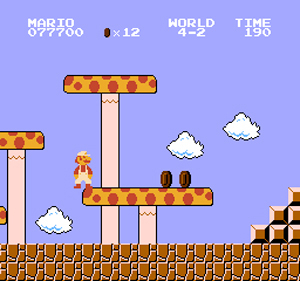 Warp zones that transport Mario or Luigi to higher levels can be found in select areas, and hidden beanstalks can be uncovered to allow Mario to climb up into clandestine cloud lands rife with bounties of coins. Extra lives are riddled throughout the game as well, and coins can be attained by jumping on them or knocking bricks or Question Mark Blocks. Mario can also have a short burst of invincibility by collecting a Starman, in which all enemies ricochet off of him and out of the screen. However, a few of Bowser's castle levels are mazes that require Mario to take the correct routes in order to progress further. 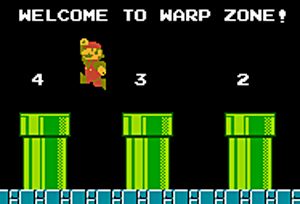 If Mario takes the incorrect routes, he will continuously be transported back to the beginning of the level and time will eventually run out, resulting in an inevitable death. Running out of time is not the only way Mario can lose a life. Falling down a pit or running into an enemy as Regular Mario, will do him in just as badly. One of the unfortunate aspects of Mario is that he will resort to Regular Mario with one hit as Fiery Mario. In Super Mario Bros. 3, Nintendo amended this characteristic by having Mario knocked back to his previous form, which was Super Mario, rather than the wee little Regular Mario. 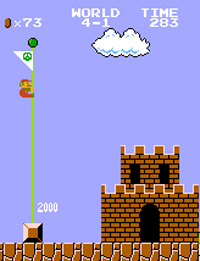 At the end of each level resides a set of steps and a flag for Mario to jump onto and slide down, and if the timing is just right, fireworks will blast off, awarding Mario with extra points. In terms of characters and game design, Super Mario Bros. gets an A+ for originality, especially for being the first commercially available Nintendo game in existence. Although the story in the manual is a bit farfetched with horse-hair plants and Koopa black magic, the game is so lovable that it can be played over and over again until the end of time. If you have access to a Nintendo Entertainment System, Super Mario Bros. is a requirement if you want to own a bonafide slice of quintessential Nintendo history.